Open at Clarence mill, Bollington in the Happy Valley! Picture library now available online! Bollington Civic Society has developed a Discovery Centre for Bollington. It is located on the canal side at Clarence mill, bringing together the history of this and other great mills of Bollington, the Macclesfield canal and showing their place and importance to the town – the Happy Valley! Here you will find the story of Bollington, from an agricultural backwater in the Macclesfield Forest, to the realisation of the use of its streams and rivers to power the cotton mills that made the town what it is today. King cotton may have gone but fortunately several of our mills survive, finding new and valuable uses in the modern era. Discover the importance of the people of the town – how they worked and played. Climb the stairs to the Gallery and search the picture database for the historic images of the past, find the people who developed the industries, see their fine houses; find the people whose sweat made those industries great, see their cottages and streets. Look at the fine views over the town, often from White Nancy, and see how many of the buildings you can recognise today – it’s surprising how many of the old buildings have gone, but many remain, and how many new buildings there are, even in an old town! Additional display items are provided! A glass top display table is used to show more local items of interest – come and have a look soon! Winter closing: Please note that the Discovery Centre will be closed throughout December 2018, re-opening on Saturday 5th January 2019. Organised school and group visits can be made outside the normal opening times to suit the school timetable – see School Visits below. The Discovery Centre can be opened at other times for group visits or other special purposes by arrangement – see contact information below. We regularly feature displays of art and local history at the Discovery Centre. The one hundredth anniversary of the canal breach at Kerridge, locally known as the ‘Bollington Burst’ was celebrated with a special exhibition of pictures taken of the breach and its aftermath. This project has been most generously supported by the Heritage Lottery Fund , Cheshire Rural Recovery and the North West Development Agency, Clarence Mill Properties Limited, Macclesfield Borough Council , Bollington Town Council , Macclesfield Canal Society and private contributions. The Discovery Centre is easy to find – from the Macclesfield direction drive through the main streets of Bollington to the traffic lights; turn left up Clarence Road. If you are coming from the Whaley Bridge or Pott Shrigley direction it is just as simple; drive through the town to the traffic lights and turn right. Clarence Mill is in front of you at the top of the hill; follow the road to the right of the mill and turn first left into the mill yard. The multi-story car park is in front of you. Park and find your way on foot; look for the tunnel through the mill and turn left along the canal side. The Discovery Centre is just before the archway. On foot, walk up Clarence Road and turn left into canal side in front of the mill. The Discovery Centre is just beyond the café, through the archway and first door on the right. We welcome school visits. One of the main purposes of the centre is to provide educational opportunities, particularly to local children, in order to help them understand why their home town has developed to what they see today. The centre will be opened specially for visits so that the children are the only visitors at the time. This will provide teachers with the uninterrupted opportunity to speak to their children as a group and show them the things they especially want them to see. For further details please see contact information below. One of our greatest assets is our unique collection of historic pictures of Bollington. We have over 5,000 pictures taken from as early as the 1860s to more modern times. Click here to see the pictures pages. The picture library is also available online! . Many family history researchers have easy access to the 1851, 1861 and 1871 Census data and may be looking for relatives living in Bollington around that date. The photographic records are, unfortunately, of little help as the earliest ‘people’ pictures date from around 1890 (Bollington Cross school and Lowerhouse school class photos). Most of the school and family photos are from 1900 on, and most are not annotated with the names of the people pictured. Take a walk through the town with one of our walk guides to show you the way and to describe what interesting buildings and features you are passing. The Bridgend Centre has prepared two town walks to help you find the corners of Bollington that only the well informed would discover! Starting from Clarence Mill, this trail takes you down into the Recreation Ground and through some interesting back ways that you might never have guessed were there! Don’t forget to look out for Telford’s third Bollington aqueduct, and certainly don’t miss seeing the river flowing out of its tunnel – did you ever hear of a river in a tunnel before? Continue to West Bollington. For an extra mile go down Albert Road and look at the historic buildings of Lowerhouse – presently being considered for inclusion in a Conservation Area. Developed by Samuel Greg, this community was an outstanding example of early social engineering, designed for the benefit of the mill workers and their families. Not to be missed. 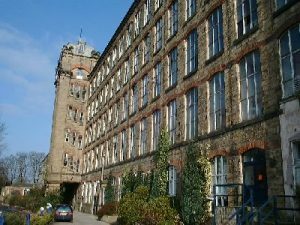 From West Bollington head up Grimshaw Lane for a look at Adelphi Mill. Turn left onto the Middlewood Way and follow it across the railway viaduct, enjoying the views on the way over. Continue to the Tip Farm exit then head off up to Sugar Lane, turn left and very quickly descend to the canal towpath. Turn right and head back to Clarence Mill. Don’t forget to get the Majestic Mills trail guide (free) at the Discovery Centre for a full description of the sites of interest that you pass along the way. Alternatively, continue along the towpath to Aqueduct Cottage, just beyond the aqueduct, and walk down the Hole I’ th’ Wall steps to Palmerston Street. These steps are steep and not suitable for the infirm or very young children. A safer route is down Hurst Lane from Aqueduct Cottage and turn sharp right at the bottom into Palmerston Street. Walk under the aqueduct and turn left up Clarence Road to the mill. This trail takes in the oldest streets in the town including Queen Street and High Street. It is then decision time! You can take the short route back to Clarence Mill via Gleave Avenue and Hurst Lane, or you can take the low road across the bottom of the hill to Kerridge. If you choose the hill then there is an opportunity to climb to the summit to see White Nancy close up and survey all of old Bollington and the wonderful longer views over the Cheshire Plain and the city of Manchester to Winter Hill beyond – weather permitting. For those who want just a short climb, stopping half way up still provides a very good view! From Kerridge there is the delightful walk across Hollin fields and down to the Macclesfield Canal at Bee Hive bridge 28. Return to Clarence Mill along the towpath passing Adelphi Mill and over two aqueducts with glorious views from Palmerston Street aqueduct. Don’t forget to get the Yesterdays Folk trail guide (free) at the Discovery Centre for a full description of the sites of interest that you pass along the way. Of course, there is much more to see in Bollington than that covered by the two trails. They are designed to give you a flavour of the town. It is the kind of place that rewards many hours spent walking around the whole area. Buy one or two of the books describing the town and its history and then explore for yourself. I’m still making discoveries after 40+ years of living here! We stock a number of books and guides, all related to Bollington and the local area. We re-published some of the books and booklets that have previously proved popular in Bollington but were out of print for many years. Please have a look at the Discovery Centre books page for details. Please contact the Discovery Centre if you have any questions, want to arrange a group or school visit or for mail order books. The Discovery Centre is not manned full time. This number goes to the Town Hall which is open on weekdays. The Discovery Centre was opened in May 2005 by John & Terry Waite. A partnership project managed by Bollington Civic Society with the Macclesfield Canal Society . Most generously financed by the Heritage Lottery Fund , Cheshire Rural Recovery, Clarence Mill Properties Ltd., the Macclesfield Canal Society , Macclesfield Borough Council (now Cheshire East Council) , Bollington Town Council and private donors.